HONG KONG - Xinjiang Goldwind Science & Technology Co, China's largest traded wind-turbine maker, may raise as much as HK$9.09 billion ($1.2 billion) in a public share sale, said two people with knowledge of the matter. Goldwind, which is already listed on the Shenzhen Stock Exchange, is offering 395.3 million new shares, or a 15 percent stake, at HK$19.80 to HK$23 each, said the people who declined to be identified before an official announcement. The shares will trade in Hong Kong. China led global spending on renewable energy last year as it seeks to reduce reliance on coal and imported oil. The government is pushing producers to make larger turbines that generate more power, a move that benefits the biggest companies including Goldwind, according to Patrick Dai, a Shanghai-based analyst at UBS AG. 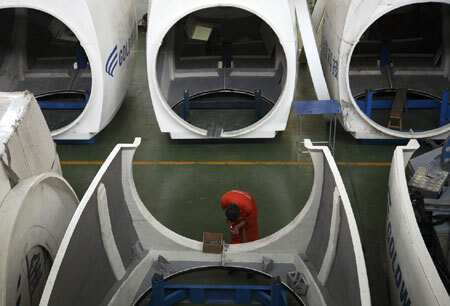 China's government uses "renewable energy as a measure to restructure future economic growth", Dai said. The development of larger plants will put a premium on companies that can create new technology while making obsolete older products that are in oversupply, he said. Goldwind's Shenzhen-listed shares dropped 2.23 percent to 22.32 yuan ($3.27) on Monday, giving the company a market value of 49.997 billion yuan. China, the world's largest coal consumer, invested $34.5 billion in low-carbon energy technologies in 2009 compared with $18.6 billion for the United States, according to Bloomberg New Energy Finance. The government wants to install 150 gigawatts of wind power by 2020, compared with 25.5 gW installed as of last year, New Energy Finance said in a May report. The government earlier this year restricted entry to the wind power business to companies that can build 2.5 megawatt turbines or bigger while excluding companies that haven't sold more than 1 gW of capacity, Dai of UBS said. "There's a very high barrier to entry now." Goldwind will spend about 40 percent of the proceeds of the sale on building production bases, 24 percent to expand into overseas markets, 15 percent for design and development, 11 percent to pay off loans and 10 percent as working capital, one of the people with knowledge of the matter said. The price range for the sale values the company at 14.7 times to 17.1 times its 2011 earnings per share as estimated by banks involved in the sale, said one of the people. China Longyuan Power Group Corp, the nation's biggest wind-power producer, trades at about 20 times 2011 earnings per share, according to data compiled by Bloomberg. "Because the PE (Private Equity) level is not too high, it's quite reasonable; it should attract investors' interest," said Kenny Tang, a Hong Kong-based stock analyst at Redford Assets Management Ltd. "I think the response won't be too bad." The company is the world's fifth largest wind turbine producer and will likely post consolidated profit of at least 2.2 billion yuan this year, according to a draft share sale prospectus. Goldwind is attempting the largest Hong Kong share offering, excluding rights offers, in more than two weeks, according to data compiled by Bloomberg. Hong Kong's Hang Seng Index has lost 11 percent since April 9 as the debt crisis in Europe has reduced investors' willingness to take risks, leading at least three companies to pull Hong Kong initial public offerings. China International Capital Corp, Citigroup Inc and Credit Suisse Group AG are managing the sale, they said. Swire Properties Ltd scrapped a plan to sell shares in Hong Kong on May 6 as the Hang Sang posted its biggest weekly drop since November, its parent said in a statement then. Strikeforce Mining & Resources Plc, the Russian molybdenum producer controlled by billionaire Oleg Deripaska, delayed taking orders for its IPO in Hong Kong until equity markets have stabilized, a person with knowledge of the decision said on May 8. Newbridge Capital LLC sold a HK$9.7 billion stake in China's Ping An Insurance (Group) Co on May 13, the largest Hong Kong stock sale since January, according to Bloomberg data.